"Promotional Shipping discount", "Unit Info", "Insurance", "Payment Instruction", "Gift Service", "EAN"
Listing and image upgrades: "Featured","Highlight", "Home Page Featured", "Value Pack Bundle", "Gallery Type", "Photo Display Super Size or Picture Pack"
Known problem: PrestaShop 1.5 multi-store support is limited. Starting from PrestaBay version 1.5.0 we support PrestaShop 1.5. PrestaBay module continue support for old PrestaShop version 1.4 and 1.3. If you decided to upgrade your store to latest PrestaShop version you can use same module archive. Very often on PrestaShop product represented as product with combination options but eBay marketplaces or eBay category not support list variation product. Only reason for this case it's list to eBay this product as separates products for each combination. This option can be activated by created new "Selling List". Please notice you need to have disabled "Variation" option on "Selling Profile". Each product title also include combination information like color, memory size and so on. Please notice! 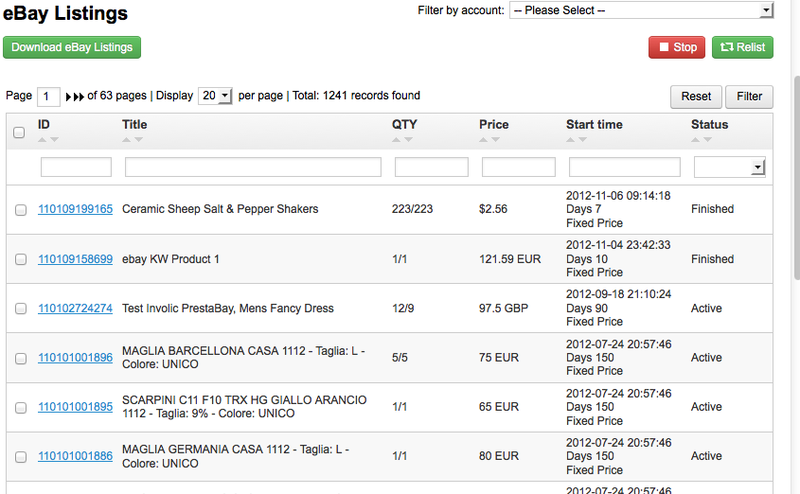 Starting PrestaBay 1.5.0 we change logic of working with eBay category mapping. On PrestaShop 1.4 we use all Product categories for mapping. 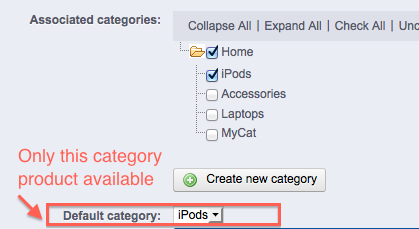 Currently only "Default" category is used. This decision was made in regarding to duplicate listing problem. So currently you can see situation when for some category that have product on PrestaShop you don't see product on PrestaBay. 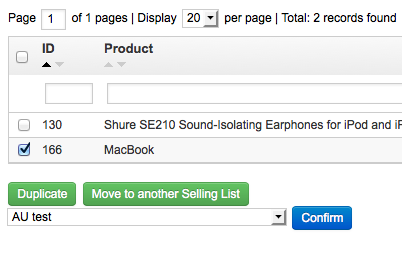 In current version of module you have possibility to map one Selling List to multiple eBay categories. In new PrestaBay version we add possibility to manage your existing eBay Listings not connected to PrestaBay. Access to this feature can be possible throw menu "Catalog->eBay->eBay Listings"
Initially on this page you will not see any items. You can force import "Active" eBay listing to PrestaBay by click button "Download eBay Listings". All future listings (new listed, stopped, relisted) will be automatically added to this page during execution PrestaBay synchronization. With each listing you have possibility stop or relist it. During relist operation new row for this table will be created with new itemId, old one remain unchanged. When you list/relist/revise item from PrestaBay interface you will see fee apply to this operation. Please notice that during automatic synchronization process fee values not saved. New fields on "Selling Profile"
We add lot of additional configuration option to "Selling Profile". Please see screenshot for more information. We add possibility to duplicate current "Selling List". Also it possible to move some items from one "Selling List" to other. We improve grids used in PrestaBay. Currently each grid will save your order, pagination selection and restore each time when you open it. Pagination selection (like items per page) saved for all grid in PrestaBay. Specific settings (like sort order) saved for specific page. Filter settings saved only for realtime (during you use selected grid). We also add more mass-actions for "Selling List". Just now possible not only revise all items but also "Stop all active", "Stop all with QTY = 0", "Relist all with QTY > 0". In PrestaBay 1.5 we add possibility to contact us directly from PrestaBay interface. 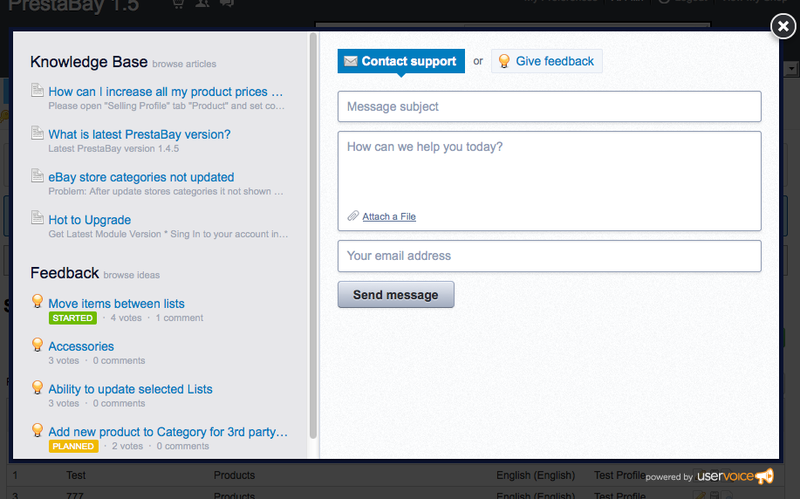 On the top PrestaBay menu you can find button "Support". After click on it you will see special form where you can fill your request. Also using this form you can leave your idea for PrestaBay improvement. Starting from this version you can observe three new synchronization options. 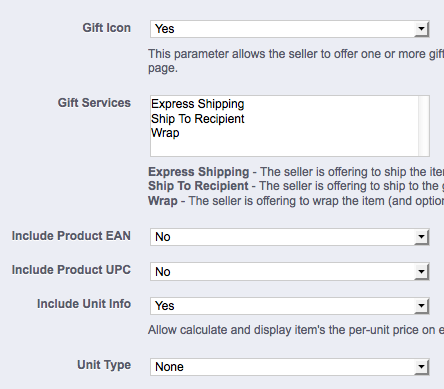 Each of this option can be usable in case when you use third-party software to update your PrestaShop catalog. Also if you use csv import module or some similar software using such option can help update eBay listing properly based on values in PrestaShop. Important! Each of this option required additional cpu resources for run it. So in case when you update your Product only using PrestaShop interface it does not need to enable it. Resynchronize QTY - check QTY in PrestaShop and values saved in PrestaBay. When values not update PrestaBay items and mark it as revise required. 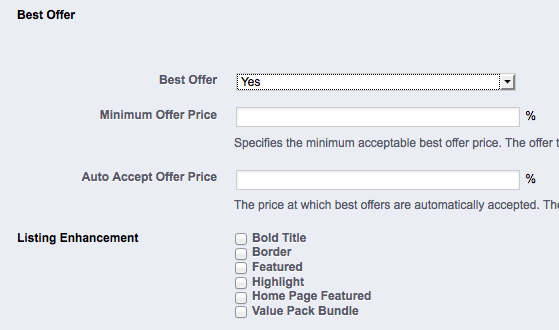 Resynchronize Price - check Price in PrestaShop and Price for eBay Item. When price not match mark PrestaBay item required to revise. Resynchronize Category Products - synchronize PrestaShop category producs with products assigned to PrestaBay selling lists with "Category" mode. This operation is heavy in performance so please enable it only category structures has been changed. Thank you for stay with us. If you have some idea that improve PrestaBay module do not hesitate to create in on involic.uservoice.com or by email to prestabay@involic.com. We will be grateful to you if you leave your testimonial of using PrestaBay module by fill our “Testimonial Form”. Thank you!